I found treasure in my safe! How cool is it that i even HAVE a safe?! ha ha…i bought one a cple years back when i was in splurge-mode after hearing horror stories of important documents going up in flames. I also always thought it was “cool” using them at hotel stays, and seeing rich people use them on T.V. The most awesomest being Scrooge McDuck’s of course, from Duck Tales. 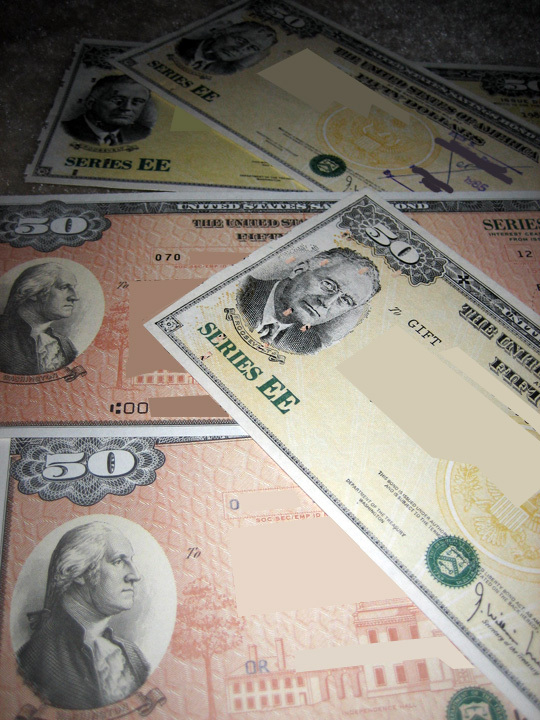 At any rate, i was digging through it a few weeks back and came across an envelope full of old Savings Bonds I got when i was a wee one. My Grandparents were HUGE fans of these things, so I’m dedicating this post to them. Thank you much G-ma & G-pa! The most awesome thing about ’em is that they just LOOK so old! i don’t know what they look like now, but seeing the typed out text makes me laugh a little…i can see a banker putting one through a typewriter or something. 2) How much are they worth now? 3) What do the “EE”‘s stand for? 4) Can i just roll up to a bank and turn them in willy nilly? And if so, what if I have an online back (I use USAA), would i get charged some crazy fee if i tried giving them up to a different bank? 5) Do i need to prove who i am? I’d imagine i’d have to show proper I.D. to prove my name, but i’m hoping not for the address that’s listed on the bond…i’ve moved 20+ times in my life and can’t imagine showing this proof. 6) What are the tax implications? Maybe there’s some sort of tax-free status, considering i’ve been waiting over 20 years on some! i highly doubt it though. Have a most joyous weekend everybody, and HAPPY BLOGGING!!! Next post: It’s Monday, and i’m off to VEGAS!! !